The squirrel you see in your yard might be there thanks to me. That’s because I trap squirrels alive in my yard, put them in the trunk of my car, and let them go free wherever I happen to be driving in the neighborhood: the grocery story, the park, a party, anywhere that’s at least a mile from our home. If your house is on my route, I could let my squirrel go in front of it. I never rid my property of squirrels this way, because the neighborhood is infested with them. They’re in all the trees. All the parks. All over Denver. But, I can put a temporary dent in the population around our home, stopping them during harvest season from devouring our tomatoes, pumpkins, and zucchini from our garden—and the fruit from our trees. This year, with sporadic trapping, I got to pick about 25 percent of the peaches from our tree. I’m hoping to do better next year. My admittedly weak justification for depositing the squirrels elsewhere in the neighborhood is mostly based on the fact that the area is infested to begin with, so I’m not really adding unwanted squirrels to my neighbors’ yards, especially because I never release two squirrels in the same location. Squirrels are already everywhere, and the greatest number of squirrels I might have released in front of your house is one. Plus, most of my neighbors don’t seem to care about the squirrels, and many like them! Or are at least entertained by them. Once a passer-by saw a squirrel in my trap and set it free. 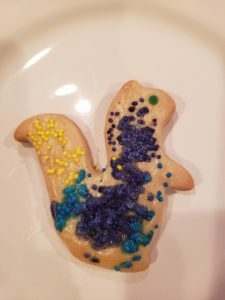 My sister even makes squirrel holiday cookies. 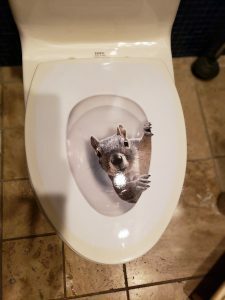 Squirrels even adorn toilet seats in some houses. I’ve discovered a subculture of squirrel ridiculousness and “cute” products out there on Google. And lots of my neighbors actually feed these animals, whose predators (fox, coyotes, hawks) don’t kill enough of them to hold the population in check and stave off the destruction they cause. Feeding these arboreal rats, swelling their infestation, is arguably worse than my relocation project, I tell myself. And there’s a wider societal benefit to the existence and productivity of my garden, which is completely organic, hyper local. By reducing the number of squirrels around my house, I’m cutting down on food processing, chemical sprays, exhaust-filled car trips to the store, and more. I’ve thought about killing my squirrels many times, like a neighbor up the block does. She catches them alive and drops the trap in a barrel of water, drowning the rodents. Another friend shoots them. Another option would be to drive to open space and release them, like another friend does. He’ll go up to Golden or beyond. But I honestly don’t have the time, and it’s not right to upset nature’s balance with more of this type of mammal. Part of the reason my friend drives his trapped squirrels so far away is, he thinks if he doesn’t, they’ll journey back many miles to his house. He actually spray paints the squirrels’ tails green before letting them go, to see if they make the impossible trek to his trees. Many years ago, my 5-year old son and I tried to sabotage him by spray painting the tail of one of our trapped squirrels green, and then letting it go in front of his house. My kid couldn’t contain himself and revealed our prank immediately upon seeing my friend. He never caught our green-tailed squirrel anyway. And we never saw it at our house either, which is about a mile away. In any case, unless I come up with a better idea, I’ll continue to deal with my squirrels with my trap-and-release routine. It’s a bad solution, and I’m sorry if my squirrel eats your peach. If you respond in kind and dump squirrels on me, I completely understand. Our country doesn’t need more polarization, much less a squirrel war, and I feel guilty. But I don’t know what to do. CORRECTION: This post has been corrected to state that Colorado residents can kill “nuisance” tree squirrels on their property. 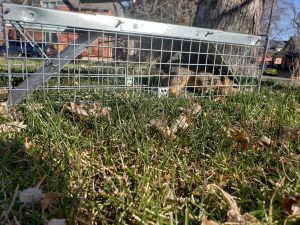 But they cannot relocate squirrels without, among other requirements, notifying Colorado Parks and Wildlife and securing permission to do so by the owner of the land where squirrel would be set free. Can you trap trollish "Squirrels! ", too? I'd settle for a gif of a trapped squirrel to post when someone derails a substantive , evidence-based policy discussion. Assuming that we ever have one of those on here. • Colorado Parks and Wildlife (CPW) has been notified in advance. • The relocation site is appropriate habitat for the species. • Permission has been obtained from the landowner or managing agency where the animal will be released. • The relocation must occur within 10 miles of the capture site for squirrels and rabbits and within 2 miles for raccoons. One of my neighbors kills the nuisance squirrels and I support him. I think his approach with a fast snap trap is more humane than relocating squirrels. Relocated wildlife has a poor survival rate according to small scale studies. Better a quick death than a slow lingering one out of sight. If Mr. Slazman is releasing the squirrels within two miles of his back yard it is also ineffective. An informal study of squirrels returning found that 5-7 miles is needed to get down to only 1/12 returning, though a few will even return if taken 25 miles away. I'll correct my post now. thanks! My former boss bought a home in Park Hill 30 years ago, and his wife complained about the constant “rain on a tin roof” sound of galloping squirrels (amplified by the huge attic). So he hires a company to come out and vacuum up the squirrels (whee!). After about 30 or 40 squirrels got the full helter skelter ride at a not insubstantial fee, he said enough! Within a few days, the herd on the roof returned from their vacation to resume their play. Our squirrels just trigger our outside motion detectors, sending messages to my inbox each day.